Step 1: Fill a large glass to the very top with ice (crushed ice is preferred but not required). Step 2: Slowly add very cold water until the water reaches about one half inch (1 centimeter) below the top of the ice. Note: If the ice floats up off the very bottom of the glass at all, the ice bath will likely be warmer than 0.0°C. Pour off any excess water. Step 3: Gently stir the ice mixture and let it sit for a minute or two. Step 4: Make sure your infrared thermometer is set to an emissivity setting of 0.95 or 0.97. Step 5: Hold your infrared thermometer so that the lens or opening is directly above and perpendicular to the surface of the ice bath. Note: If you hold your infrared thermometer too far from the surface of the ice bath or hold it at an angle, your measurement will include the sides of the glass or container or even the table it is resting on and give you an inaccurate reading. Step 6: Taking extra care to ensure that the field of view (the size and shape of surface area being measured) is well inside the sides of the glass or container, press the button on your infrared thermometer to take a measurement. 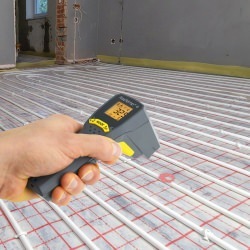 If you perform the test correctly, and your infrared thermometer is properly calibrated, it should read within your unit's stated accuracy specification of 0.0°C. Infrared thermometers cannot typically be calibrated at home, but they are known for their low drift. If the results of your ice bath test are within your unit's manufacturer's listed specification, you are good to go. If, however, you get a result that is outside the listed accuracy specification, you should contact the manufacturer. Feel free to contact the ETI Calibration Laboratory at sales@etiltd.com with any further questions.